While NAAQS apply everywhere, some areas are subject to additional rules. 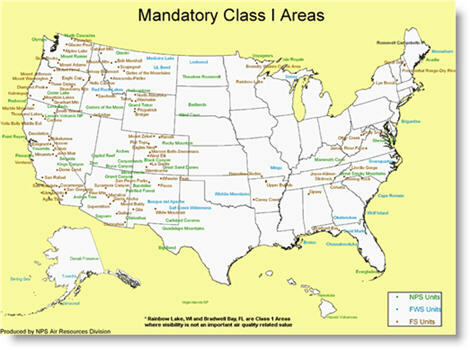 Areas designated as Class 1 areas by congress have special significance and value to the public. Class 1 Areas include many national parks and wilderness areas. As such, these areas have special goals to improve the levels of visibility, and prevent any further impairment of visibility due to human induced air pollution. The Regional Haze Rule (RHR) was finalized in 1999 and its amendments finalized in 2005. In 2016 it will be undergoing further revision. The rule exists to protect visibility in Class 1 Areas, as well as requiring States to participate in planning to reduce haze (regardless of whether or not they have a Class 1 Area within their borders). This is because pollutants that contribute to haze, such as PM 2.5, organic carbon, and sulfates, which are emitted in one State, can be transported into other States. States must develop long term strategies to create emission reduction measures for all pollutant sources, including prescribed fire, and demonstrate reasonable progress in meeting visibility goals. Section 308 of the rule requires States to submit State Implementation Plans (SIPs) outlining how they plan to reduce emissions which contribute to regional haze. The end goal is to achieve natural visibility conditions in Class 1 Areas by 2064.